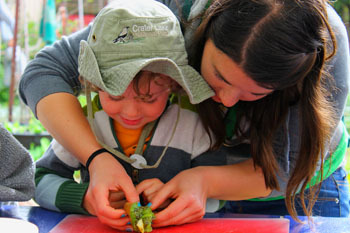 Sarah Preston—a proud Banana Slug who holds several jobs—enjoys working with children. 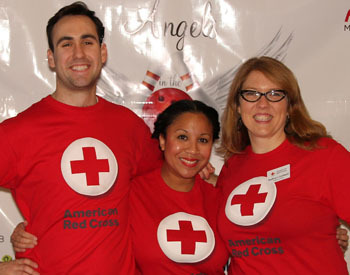 Timothy Irvine, pictured here with two colleagues, is enjoying his work for the Red Cross. His social media skills and his love of media production helped him get the job. By Timothy Irvine and Sarah Preston of UC After Cruz, a collaborative blog by Banana Slug alumni dedicated to sharing advice and life experiences after college. Editor's note: With this year's commencements and celebrations nearly upon us, we present a look at what comes next—the sometimes difficult transition period between college and career. The first year is often the hardest. So we spoke with the experts—recent grads—who offer this advice to those about to leave the UCSC nest. Congrats to all Banana Slugs about to graduate! We wish you the best of luck, and keep in touch. Don't be surprised if you feel a strange combination of relief and panic after graduation. As difficult as college can be, the first year out in the real world is no cakewalk. You may experience financial hardship and anxiety. But this transitional time doesn't have to be a shipwreck. Just remember: UCSC has given us amazing tools to thrive in today's marketplace. Here are some suggestions for surviving your first year after college. When I (Sarah) graduated from UCSC with no future plans, I was nervous and unsure of myself. When fall quarter began, many of my friends were beginning their senior year at UCSC. I hung out with them as if I'd never graduated. Staying in the past caused problems, including late-night hangouts that didn't coincide with my new work-four-jobs-just-to-pay-the-rent life. I realized very quickly that trying to maintain my old college lifestyle was only going to hold me back. Honestly, the odds of landing your dream job immediately after undergrad are very low anyhow. Landing any job can be difficult. So how do you maximize your chances? Start by being honest about where you are in life—and it isn't college anymore. Instead, embrace your present situation and seize the opportunities available to you, even if they aren't what you imagined they'd be. Do you want to be elsewhere? Do your research, and apply yourself to that purpose, while understanding that jobs and internships are a numbers game. If you apply for a large number of positions (and make sure to apply correctly), you're much more likely to land one. One of our contributors just landed a great-paying, stock-options job with full benefits at a start-up firm in San Francisco. It's a huge accomplishment—but consider the fact that she put grad school on hold, moved in with her family, and worked four separate jobs before she got there. For a while it was a mad scramble. She spent hours hurrying to her various jobs as a nanny, a bakery worker, and personal assistant. It wasn't easy, and it wasn't what she wanted—but that's life! She adapted to her new environment, and eventually went from surviving to thriving. I (Timothy) have realized that I have little to no control over where I will live in the next five years. If an out-of-state employer is willing to kick me several thousand dollars a year for a job, I'll relocate. I don't want to move to Texas, or Oklahoma, or Canada, but if I have to move, I will, and I'll make the best of it. During your first couple months out of school, write down your priorities for the first year. The list will help you see what you want to hold onto, and what you're willing to give up. For me (Sarah), I knew I wanted to stay in Santa Cruz. I would be willing to move back home as a last resort, but it was important to me to be on my own after college instead of moving back in with my parents. Some jobs will be career track and deeply satisfying—and others are simply eat-and-pay-the-rent gigs. But if you find yourself in one of those subsistence jobs, don't give up on your dreams. There are times where you will sincerely re-evaluate what you want in life, and that's fine! Just be sure to know the difference between sacrificing your passions, and adjusting your plans in order to achieve those passions in a practical way. In the meantime, bring your passions to your day job and demonstrate your excellence in that way. For example, it is hard for me (Sarah) to be passionate about sitting at a computer doing data entry all day. But when I remember that my work supports hands-on children's learning all over the nation, it gives me the drive to keep going. I (Timothy) was hired for my current position largely because my organization needed to expand its social media outreach. In the interview, I talked about my work with blogs and photojournalism, and I brought my love of media production into what would be otherwise a strictly social work position. When I (Sarah) graduated, most people were not very accepting of the fact that, for the first time in my life, I had no "plan." This made it hard when people, including loved ones, asked tough questions. If you think, "What are you going to do after graduation?" is an annoying question, wait until you hear people say, "You sure you really want to be doing that?" The fact of the matter is, no matter what you are doing, it's your life. You have to own it. Even if you are working full time as a cashier with minimal benefits and no practical application of your degree, be strong! No one can tell you how to live your life but you. It might not be cupcakes and rainbows all of the time, but remember: just getting into and attending college were major steps. So is graduation. Take pride in what you've already accomplished, and what you will accomplish. Besides, when you get to that place you want to be one day (no matter how long it takes), it will feel good to know you got there by your own means and in your own way. The first six months out of college I (Sarah) would do all my shopping once a month because I was short on time and funds. This led to a pattern of eating PB & J or Top Ramen every night because I was just too exhausted to cook myself a meal after a long day at work. To avoid the junk food trap, I finally sat down each weekend and planned out my meals and shopping for the entire week. Now when I wake up in the morning, I already know what I'm having for breakfast, lunch, and dinner that day, which is one less thing I have to think about and keeps me eating healthy. Switching from classes, where you spend two or more chunks of time learning a specific topic, is completely different than focusing for eight-plus hours on a single work project. Working 8-5 is way more exhausting than you might realize, and the work environment might not be ideal either—especially compared to the beauty of UCSC. It might sound lame, but eating right, getting enough sleep, and exercising are crucial for your physical and emotional health. If you can afford it, get that gym membership, and take a buddy from work along with you. Learn the jogging routes and bike paths in your new city. Like we've said before, you aren't in college anymore—many habits that were fine and fun in college (you know which ones I mean) are not going to be so much fun when dealing with the daily grind at 8 a.m.
After graduation, everyone goes in a different direction. Some stick around, some move back home, and others move to a brand new city. Let's face it: Your friend group is probably going to change. College is one of the rare times in life when the people you are working, living, and learning with are all the same age. And when it's over, everyone scatters like broken glass on tile. Your number-one resource for going through a transitional period will be your peers. The worst thing you can do after graduation is sit on the couch alone every night eating a bowl of cereal. The shift in your social sphere will take some adjusting, but a sense of community is extremely important for your emotional health. If you are struggling to find a community, there are plenty of places to meet people. First off, there's work. Depending on your job after college, you might be able to bond with your coworkers. If not, try connecting with people who have the same interests with you. If you are following Tip Number 3 (Be Passionate), try to make friends with the people who are participating in your hobbies with you. If you aren't there yet, then volunteer somewhere, join a church, take a class, or hit the gym. If you are going to the same place at the same time every week, chances are you will begin to establish a community. Now, we aren't saying you have to ditch your old friends, either. You have to recognize the valuable relationships from your college days (or even earlier) and put time and effort into them. The year after I graduated, I (Timothy) took frequent trips to visit my friends in person, and did my best to keep video chatting with my friends overseas. You might not keep all the friends you had in college, but it's good to hold onto those most important to you. I (Sarah) know that none of my parents keep in touch with their old college buddies, and I don't want that to be me. With the rise of social media and technology, there are more opportunities to stay in touch with people far away than there were during our parents' post-college years. Take advantage of them! Take time to make weekly or monthly Google hangouts with your best friends from college. Facebook message your friends every once in awhile. Basically, try to keep old friends but be willing to make new ones. During your first year, it is possible to feel lonely, lost, and even depressed. That's why it's important to maintain your optimism. My (Sarah) roommates tease me for my daily pep talks. Very often I wake up not wanting to go to one of my many jobs. But I tell myself (out loud), "All right Sarah, you are going to a job where lives are being changed so you can have a roof over your head and food in your stomach. You can do this." Silly as it may sound, it puts things in perspective and gets me out the door. If you ever feel discouraged, remember that your education has empowered you. And don't be frightened by this transitional period. By definition, transitions are temporary; eventually, you will transition out. Above all, remember that you aren't alone. Life after college can be scary, but it is also an exciting time! Take time to enjoy your last weeks of college, and be excited about the future. Keep your head up high. Congratulations, and good luck.